LONDON, England (CNN) -- Taking inspiration from nature, designer Ross Lovegrove has brought beauty to an everyday object that few give a passing thought to: the streetlamp. 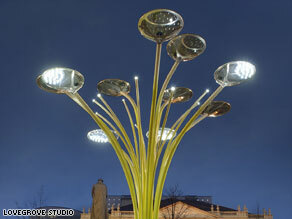 Ross Lovegrove's 'Solar Tree' at night. The second generation tree will be fully automated and able to follow the sun. The energy intensive lamps are quite literally, and figuratively, getting a green makeover and may be sprouting on a street near you soon. Lovegrove's innovative lighting project, the "Solar Tree," is a solar-powered streetlamp that also serves as a piece of modern art, infusing a bit of nature into the usually gray urban landscape. He believes that putting complex natural forms in a city can benefit all of society. The "Solar Tree" has a striking green trunk and ten branches with solar panels that radiate light on the street below. "The light looks pretty good when it's off. Most of the other lights out there have no life in them when they are off. I've seen more life in an old guy sleeping on a park bench then I have in some of those other streetlamps," Lovegrove told CNN. During their stay in Vienna the lamps were still able to give off light after four days without direct sunlight, making them an effective form of lighting. "When we were setting up the tree outside it was quite wonderful," Lovegrove said. "Even when we had one stem, it was incredible, it seemed so insignificant but actually it really stood out and it proves this point that modern technology and design can really lift people's spirits, it becomes an eye catcher because it's sort of out of context. "The Solar Tree is just a streetlamp but actually some of the small things which can have a big impact on our life are all open for reinterpretation." Since their debut in Austria, the trees have been seen budding on some of Europe's most famous streets: Milan's Piazza della Scala, Paris's Champs Elysees and during Frankfurt's Light+Building 2008. But this success is not enough for Lovegrove; he is already working on the second generation Solar Tree; one that takes even more inspiration from Mother Nature's perfect designs. Called the "Adaptive Solar Tree," it will be fully automated and have robotic features. This new design is not only modeled after real trees but also sunflowers. Like a bunch of sunflowers, whose heads are trained on the sun all day, the adaptive solar tree follows the sun to optimize energy. Lovegrove Studios told CNN exclusively about their new project: "The branches will follow the sun, responding and adapting to the architectural environment, escaping the shadows and following the sun to optimize energy income." When the sun goes down the solar trees will return to their original position to give off a full spectrum of light to the street and pedestrians below. The new tree will also be able to respond to different weather, for example the branches will come together if the wind is too intense. Lovegrove also hopes to integrate an air purification bubble into the new trees, enabling them to clean the air around them, much like a real tree. Christina Werner, director of the program in Vienna, said: "Someday soon solar trees could well be the main form of street lighting in Europe." The award-winning Welsh designer has always had a strong relationship with nature which can be seen, not only in the "Solar Tree," but in many of his other designs. Lovegrove considers himself a designer and an "evolutionary biologist." "One of the clues towards our future survival is the concept of bio-mimicry, where we study nature, learn from its intelligence and copy it one way or another." Lovegrove's quest for nature inspired design does not end with the 'adaptive solar tree': "The things that you see here at the MAK are just the beginning of all these other visions that I have like the solar assisted train. "Nature is a big part of my work and always has been. I've never seen it as a trend or a fashion," he said. "It's fundamental to life. Nature has a magic to it."